Best Uses are Industrial, Automotive, Chemical and Laboratory. 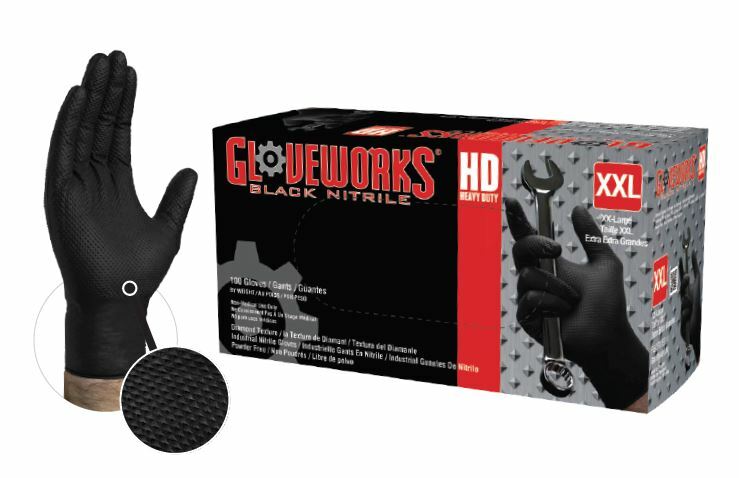 Introducing Gloveworks Heavy Duty Black Nitrile – Upgrade your black nitrile glove experience. The Glove combines an aggressive diamond texture with our most popular nitrile glove, providing a stronger, more enhanced grip with excellent dexterity and comfort. The diamond texture channels away greases and oils for optimum grip. Our newest addition to the Gloveworks nitrile brand is now available in black, a popular choice in the automotive industry. It hides dirt, grease and grime to help mechanics maintain a clean, professional look. Tough protection for demanding industrial applications, Gloveworks Heavy Duty Black Nitrile features excellent chemical resistance against common chemicals, like carburetor cleaner, and many other specialty chemicals, such as iodine and butane. These industrial grade black nitrile gloves are latex-free so those with latex allergies can work safely. Powder-free, Gloveworks Heavy Duty Black Nitrile will not interfere with adhesives or coatings. Gloveworks Heavy Duty Black Nitrile distinctive diamond texture is ideal for a variety of industrial applications, including automotive, manufacturing, janitorial and sanitation, safety and chemical industries where a secure grip is important. 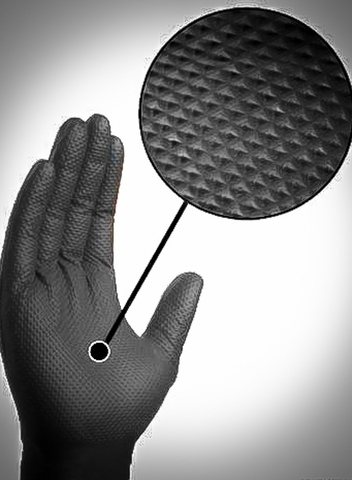 The thickness is at least 2.5X stronger than the average 4 mil nitrile glove.